Mackie and Audinate have announced the immediate availability of the new DL Dante Expansion Card, bringing high-performance networked audio to the DL32R wirelessly controlled digital live sound mixer. The DL Dante Expansion Card brings high-performance networked audio to the DL32R wirelessly controlled digital live sound mixer.The pioneering DL32R is controlled completely wirelessly, using the Mackie Master Fader control app for iPad, freeing sound engineers to mix from any location in a venue. The DL32R delivers 32 channels of powerful digital mixing with convenient direct-to-drive multi-track recording/playback, new Onyx+ recallable microphone pre-amps, in an ultra-compact 3U rackmount design. 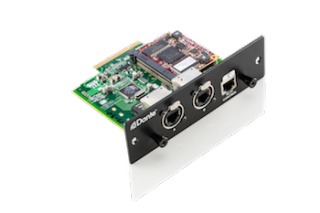 The new DL Dante Expansion Card provides 32x32 channels of network audio I/O, allowing the DL32R to be connected to any Dante-powered AV network. Dante delivers the easiest-to-use AV networking solution, featuring automatic discovery of devices, simple graphical audio routing, incredibly low latency and interoperation with hundreds of Dante-enabled products. Flexible IO patching in the DL32R lets the user route Dante signals to any channel input, and send any of the mixer's outputs to the Dante network. "Dante is the clear choice for AV networking," said Ben Olswang, Mackie senior product manager. "Dante allows the DL32R to connect to hundreds of Dante-enabled audio devices with the seamless interoperability and ease of use that are hallmarks of Mackie products. Dante software is simple and complete, and takes the mystery out of networking while delivering incredible performance." "The Mackie DL32R has had amazing market response, and we are incredibly pleased to add Mackie to the list of our 190-plus manufacturers using Dante," said Lee Ellison, CEO of Audinate. "Their products have long been favorites of musicians and sound engineers. The DL32R with Dante brings Mackie sound and usability to AV networking, allowing users to easily deliver audio where they need it, when they need it, with no compromises."